Bristol Rovers have released 12 players following their relegation from the Football League. David Clarkson, Fabian Broghammer, Seanan Clucas, Steven Gillespie, Jim Paterson, Eliot Richards and Danny Woodards are to leave the club. Youngsters Jordan Goddard, Conor Gough, Mitch Harding, Pat Keary and Josh Southway have also been let go. Meanwhile, Michael Smith, Lee Brown and Alefe Santos have been offered new deals by the now non-league side. Young winger Ellis Harrison has been placed on the transfer list while Chris Beardsley and Kaid Mohamed have returned to their parent clubs. Alan Gow, who joined on loan from Exeter in February only to pick up an injury after four games, will be given the chance to prove his fitness and earn a contract over the summer. Gow's loan move saw Richards, 22, go the other way and the forward went on to score five goals in 17 appearances for Exeter. Richards told BBC Radio Devon last week that he would be open to a return to the Grecians but on Tuesday he voiced his anger at the way Rovers handled his release. 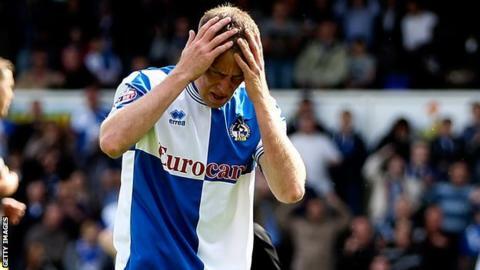 He posted on his Twitter account: "After being at Bristol Rovers since I was 16... finding out on the internet I've been released without a word. "Thought they would give me a little bit of respect. Hope they do well in the future - the fans deserve better." Rovers then responded on their website, saying: "We received a letter from Exeter a week ago exercising their option to take Eliot Richards at the end of the season, therefore we were under the impression that the player was aware he had been released. "Manager Darrell Clarke has now spoken to Eliot, and we would like to apologise for any misunderstanding that has occurred."